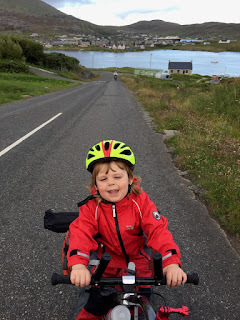 Family ByCycle: Magic Moments - Rhoda's Rolling! 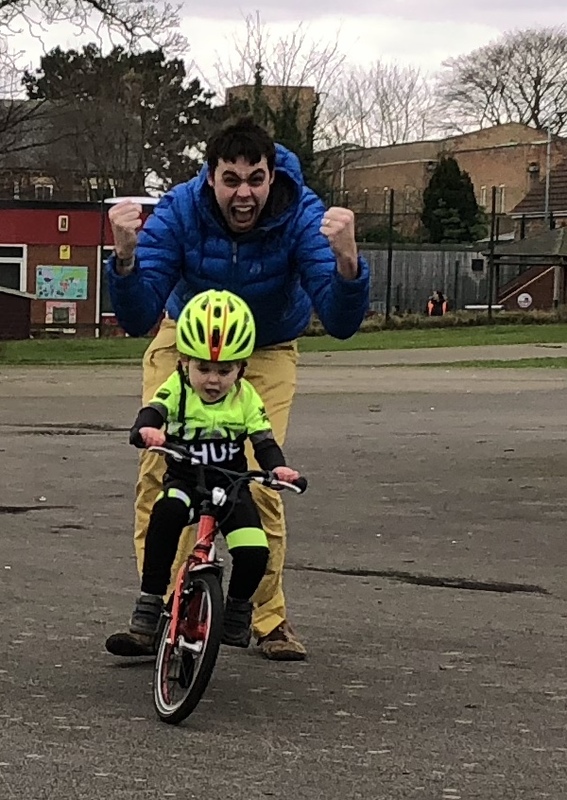 I don't know whether it's because it's not a natural skill - we are not inherently programmed as humans to ride a bicycle - but the moment your child finally, without really meaning to, sure that you can't possibly let go, motors away from you, finally letting you stand up straight and have your arms back, is a special one for me. 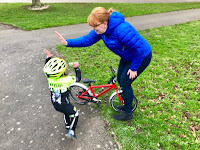 There is something seminal in the life-milestone laid as your little one goes off on their own - even if they do go on to ditch the bike ten yards away. 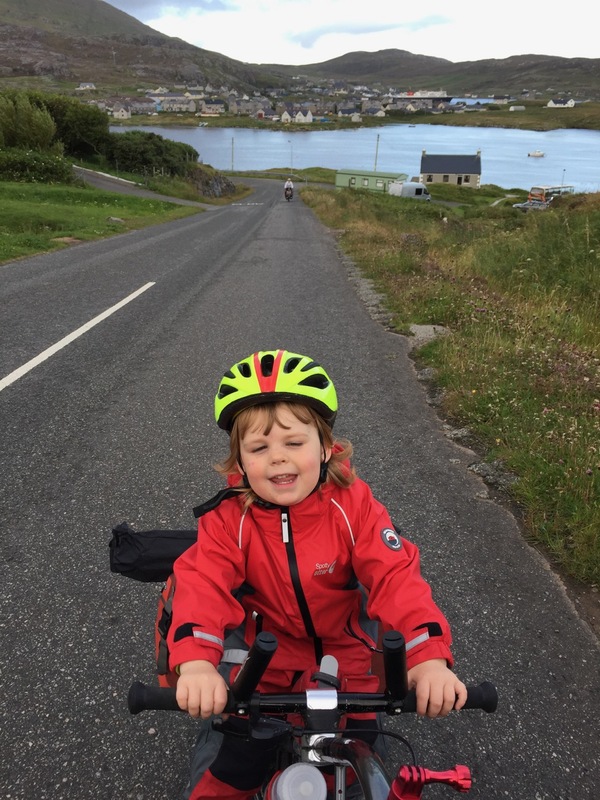 Despite her formidable progress in many areas, including her tolerance and stamina for riding her trailerbike from Vatersay to Lewis last summer, Rhoda has been a bit behind Ruth's curve when it came to pedalling her own bike. 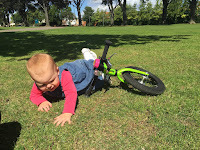 Balance biking was no problem for her - indeed she was doing it younger than her siblings - and she learned how to work her brakes very quickly indeed, but where Ruth was pedalling at two (though unable to use her brakes to stop! ), Rhoda could slow the bike to a stand nicely, but was in danger of turning four before completing her first lap of the bandstand unaided. Over the past few months we've been biding our time, just having a little go once in a while to see if she was ready without labouring it, trying both the Cnoc 14 and the 16, the latter rolling and arguably fitting Rhoda better now, but being trickier for her to swing a leg over. A growth spurt having fixed that, something possessed me to give her another whirl on Friday. 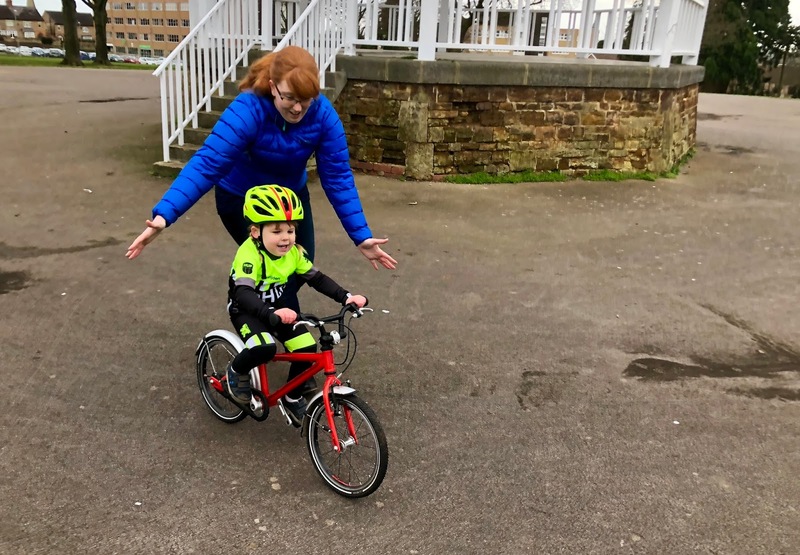 Mummy was working from home, and gave Rhoda the incentive that she could have chocolate buttons delivered to her at the bandstand - only if Daddy called to say there was cycling to be seen! When it comes to learning style, Thomas Ivor is mostly 'stick' but with specific 'carrots' (he is best motivated on the bike by anger, sometimes! ); Ruth is mainly 'carrot' and a bit of 'stick' when we get to a 'mind-over-matter' sticking point. Rhoda is all about the carrots. Especially if the metaphorical carrots are actual chocolate buttons. 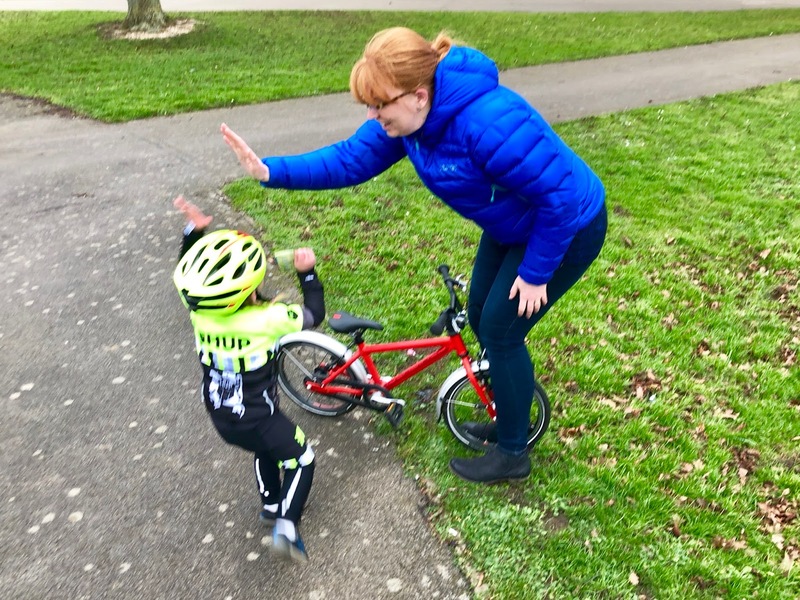 Our approach to teaching children to ride has developed over time. 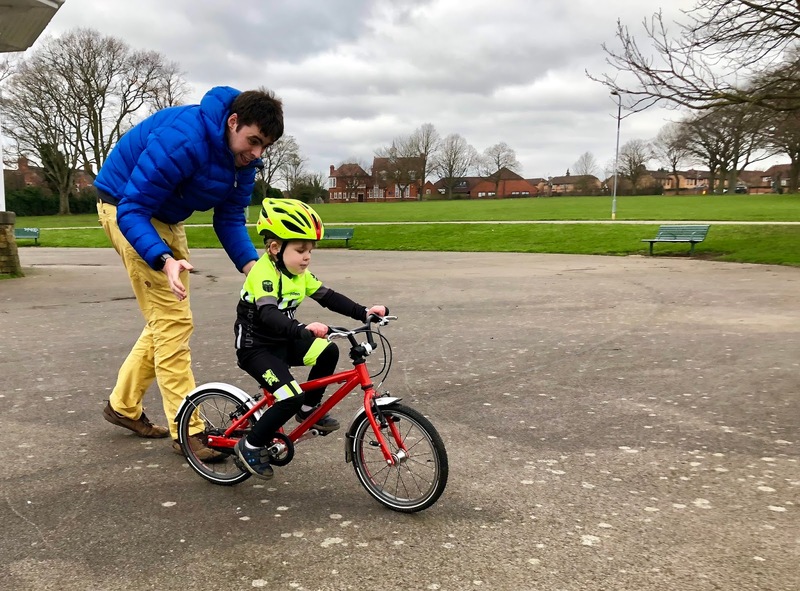 Thomas Ivor had stabilisers and a heavy bike. We've learned a lot since then! In common with many children, Rhoda had a fixation with the risk, in her mind, of me no longer holding on and preventing her from falling. Interestingly, I discovered she was far less concerned about hurting herself than hurting the bike! The answer to this is to maintain contact with the child, under the armpits, so they can feel your touch, whilst you know they are actually taking over the balance of the bike from you. Ultimately, you reach the point where they are so busy riding the bike that they don't notice your touch becoming intermittent, and then before you know it, you are running ahead to give them a target to ride towards. When you are 6'8" tall and stiff as a board, this moment can't come soon enough! Mummy was duly summoned to the bandstand, and joined in the game! 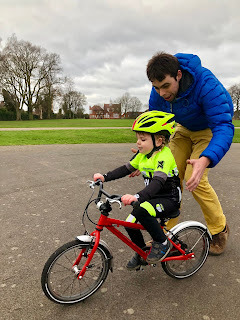 It is rather easier with two of you, not least because your little cyclist has a tendency to ride inexorably towards whatever holds their attention (often what they least want to hit, in this case the bandstand itself!) 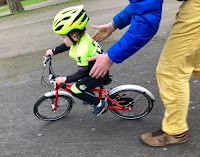 and so by having someone behind them, and someone to ride towards, their fixation becomes on the parent they're being encouraged to ride to, not the parent acting as 'catcher'. Avoiding falls at this point is very helpful, if you can pull it off; luckily, Rhoda's bike handling and braking were already pretty good. At this point, 'little and often' is the key, to embed the child's learning and cement their confidence. Otherwise, you end up teaching them more than once! 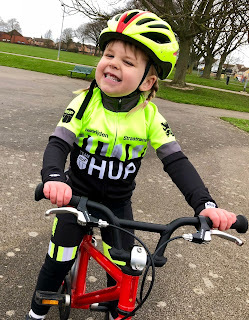 From being unable to do it properly on Friday morning, Rhoda was chasing her big sister (who felt very very grown up, offering to ride in her lowest gear to be helpful, and testing our her new heart rate monitor) round the bandstand on the Sunday afternoon. oooh i am so pleased to see this up. Gave her a great big cuddle from me. what a great achievement. My middle daughter was 6 before she mastered the art and that was because a 3 yr old neighbour who had mastered the art laughed at her and she was determined to give him no reason to laugh, and she persevered. again back then it was a bike and stabilisers. Came across from your video on twitter. 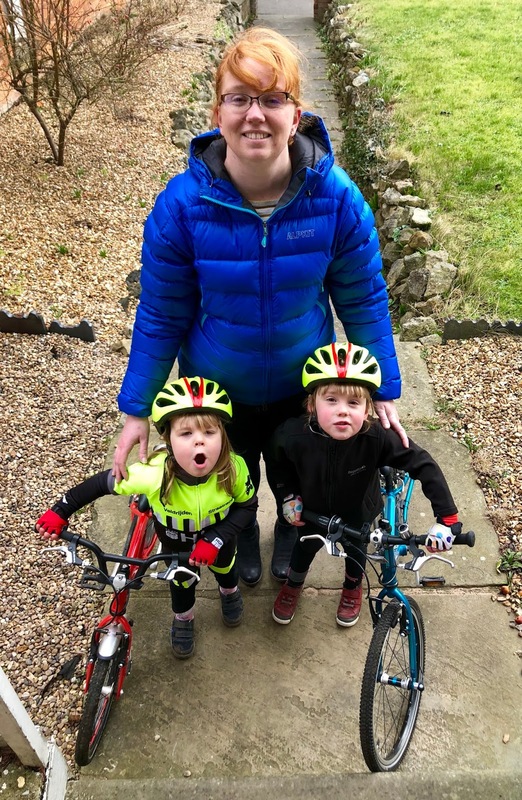 what a fab outdoor family and some of the miles you cover sounds amazing. Thanks for your sharing. I have more knowledge because of the posts. Your pieces of advice help me so much. They are awesome and helpful.